There will be a great view of the river from the Band Stand at The Promenade, and a giant screen so that you can watch the races unfold from Putney to Chiswick Bridge. We have a range of food and drink stalls to cater for all tastes, children’s fairground rides, live music from local jazz musicians – the Grey Davis Trio with guest singer Vanessa Rose, and much more. Entry is free, all are welcome. 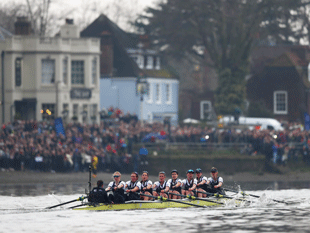 The Boat Race is a major London event between the UK’s two greatest universities – Oxford and Cambridge. Contested over 4.25 miles of tidal Thames between Putney and Chiswick Bridges and spanning 185 years of bitter rivalry, the Race has become synonymous with British tradition and excellence. The Race is regularly attended by thousands of spectators and watched by millions more at home. This year, The Women’s Boat Race will start at 2.13pm, with The Men’s Boat Race an hour later at 3.10pm. We are also participating in a Great British Spring Clean towards the end of the day, starting at 4pm. People can volunteer to do this through the Keep Britain Tidy website.